In 2015 several German €10 collector coins will be issued. The following list may not be complete, but it works for the time being. 2015 will also be the last year of the "Forest" series, with the lime/linden. The €20 gold coin was designed by František Chochola. These are the planned issue dates for the 2015 German collector coins. (*) The gold coins are made by all mints (A, D, F, G, J). They cannot be had at Bundesbank branch offices but (like the silver proof pieces) from the Numismatic Office and from dealers only. This is the winning design of the Dornröschen ("Sleeping Beauty") €10 coin. The coin will come in February - see list above - and was designed by Marianne Dietz. As usual, there will be a Cu-Ni version at face and a surcharged silver (Ag 625) proof version. I like that one. Nice. May have to watch for the Cu-Ni issue. Remagen is not part of the Unesco World Heritage site that the coin is about. That place is quite a bit further north, at the RP-NW state border. Not sure whether a railroad bridge that was there for less than 30 years, and has not been there for about 70 years, would be on a coin. This is the winning design of the Bismarck coin. Michael Otto won the competition; according to the jury his design reflects Bismarck's ambivalence between conservatism and modernity well. The edge inscription will be the quote "Die Politik ist die Lehre vom Möglichen" (Politics is the art of the possible). Here we have the DGzRS (Maritime Search and Rescue Association) coin design, by Joachim Dimanski. It shows a combination of the association's logo and a ship. More about the "Seenotretter" is here http://www.seenotretter.de/en/who-we-are/ and, as usual, in the links (first post). Edge inscription: "Freiwillig - unabhängig - spendenfinanziert" (voluntary - independent - funded by donations). One more: Leipzig will be 1000 years old next year. That is, the place was first documented in 1015. The design by Anne Karen Hentschel combines a silhouette of important buildings, and people. And while these people represent the citizens of Leipzig throughout the centuries, the scene reminds of the "Monday demonstrations" in the GDR which began in Leipzig, in early September 1989. On the edge: "Bürgersinn - Bürgerfleiss - Bürgerstolz" (not sure how to best translate those "virtues" ... Citizens/Civic Spirit - C. Diligence - C. Pride maybe). In my view, Bismarck and Leipzig are top grade designs. The Seenotretter design I find a bit overdone, too much eye trickery and not all of it successful (looks like the iron cross symbol makes some people squeamish), but if the world has real heroes, these people are. Here we have the design of the Cranach coin. Note that the piece honors Lucas Cranach the Younger, son of L. Cranach the Elder. 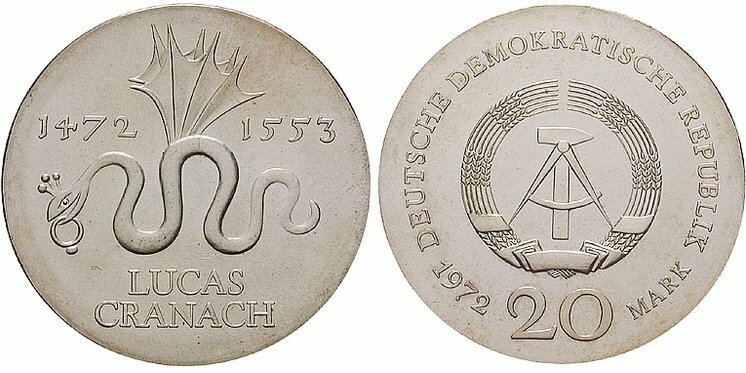 The core element is the emblem that the Cranach family started using in 1508 (see the 20M coin issued by the GDR in 1972). This €10 piece was designed by Erich Ott, so the "XY" will be replaced by Ott's "Œ" signature. Here is a larger image.